The Sin Eaters is a haunting collection of twelve short stories – with a supernatural theme – set in present day Wales. The majority of the stories are based in towns and villages that lie on the Heart of Wales Line as it runs from Swansea to Shrewsbury. In the title story – The Sin Eaters – a young woman, Sarah Vaughan, travels from London to settle in a small Welsh village and begin a new life as an artist. Soon after she moves into her cottage she experiences disturbing dreams about tragic events that happened long ago. With the help of a local wisewoman she is able to discover what happened and lay the ghosts of the past to rest. 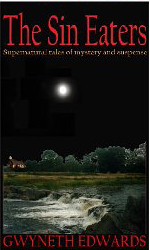 A book of short stories to download for your Kindle price £2.99. Order from Amazon.